New Democrats party and Kenney cringes. It’s Pride Week in Edmonton. 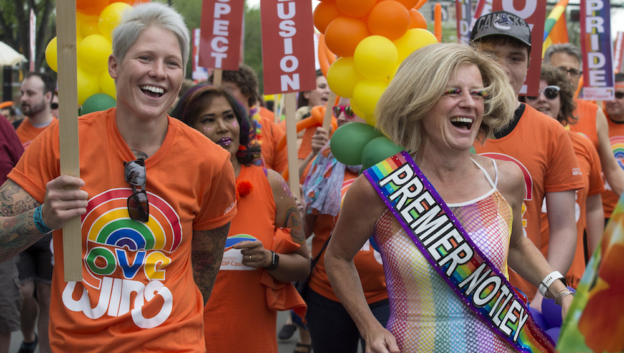 Alberta Premier Rachel Notley was dancing up a storm in front of thousands of Edmontonians at the capital city’s Pride Festival Parade on Saturday. The annual march travels down Whyte Avenue in the heart of Notley’s Edmonton-Strathcona district. Notley was joined by dozens of Alberta NDP MLAs and Olypmian Jen Kish. Kish was captain of Canada’s Women’s Sevens Team at Rio 2016 where they won bronze in the inaugural Olympic rugby sevens tournament. The United Conservative Party held its own event a few blocks away. After being declined a spot to march in the parade, UCP leader Jason Kenney announced that instead of attending the parade or other pride events, his party would hold its own event. 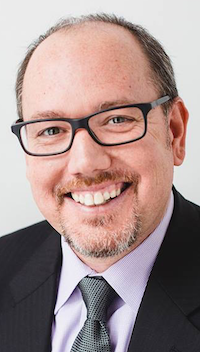 The event featured speaker Lorne Mayencourt, an openly gay politician who represented downtown Vancouver in the BC Legislature from 2001 and 2009 and was a federal Conservative candidate in 2008. This was not the first year Kenney has avoided attending Pride. As the newly elected leader of the Progressive Conservative Party, Kenney declined to attend the Edmonton Pride Festival in 2017. He also declined to attend Calgary’s Pride Festival in 2016, claiming his schedule was too full, and in 2017, claiming he was wasn’t invited, despite being invited by internationally known Alberta artist kd lang). The now-defunct PC Party participated in Edmonton Pride-related festivities in the past. Premier Alison Redford spoke at the parade in 2012 and Premier Dave Hancock rode in the parade in 2014. Even Wildrose Party leader Danielle Smith showed up at Edmonton’s Pride events in 2012. The obsession some Wildrose-turned-UCP MLAs and UCP party activists have about gay-straight alliances has certainly contributed to the party believing its representatives might feel less than welcome at Edmonton’s Pride celebrations. As a professional politician Kenney is a master at schmoozing his way into all kinds of events, so it is unlikely he did not show up just because he was not allowed to march in the parade. 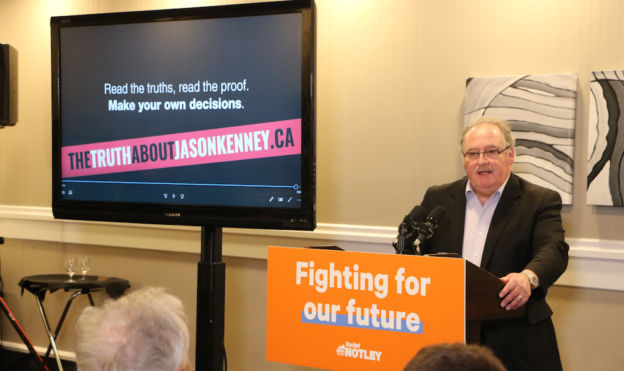 Kenney is a social conservative who has spent much of his 21-year long career in elected office opposing LGBTQ rights in Canada and he appealed to social conservatives in order to win the leadership of the UCP last year. Perhaps not surprisingly, even though he did not attend the event, Kenney has strong opinions about the Pride Festival Committee deciding not to include police and military in future parades. With an election coming up in early 2019, and Kenney’s UCP holding a solid lead in the polls, it might be unlikely we’ll see another Premier dancing in the streets anytime soon. This entry was posted in Alberta Politics and tagged Alberta NDP, Alison Redford, Danielle Smith, Dave Hancock, Edmonton Pride Parade, Gay-Straight Alliances, Jason Kenney, Jen Kish, KD Lang, LGBTQ issues, Lorne Mayencourt, Rachel Notley, United Conservative Party, Wildrose Party on June 11, 2018 by Dave Cournoyer. 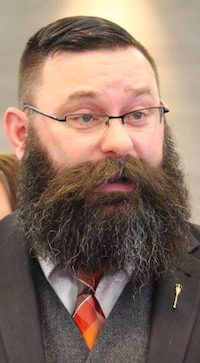 What if Paul Hinman had lost the 2009 by-election in Calgary-Glenmore? 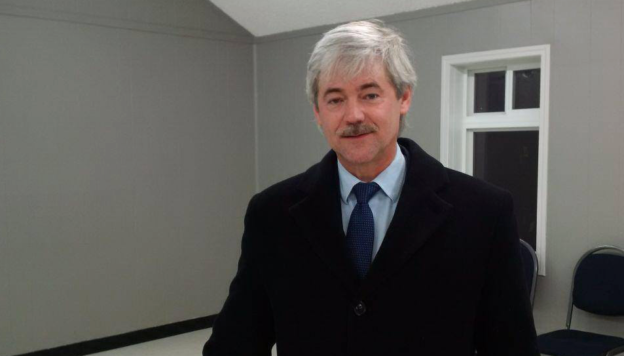 Former Wildrose Alliance Party leader Paul Hinman staged an odd and brief reappearance on Alberta’s political stage this week when he announced his plans to run for the leadership of the United Conservative Party. But when the Sept. 12, 2017 deadline for candidates to deposit a $57,500 fee had passed, Hinman did not appear to make the cut. 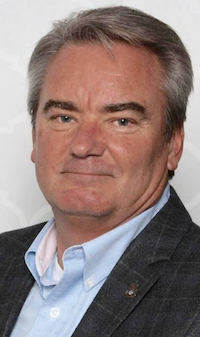 Hinman’s blip on the political radar this week got me thinking about the bigger role he has played in shaking up Alberta’s political environment. Not as a major player but as a secondary character. His time as leader and sole MLA representing the social conservative Alberta Alliance and Wildrose Alliance from 2004 to 2009 was fairly unremarkable, but it was the role he played after he resigned as leader that had a much bigger impact in our province’s political history. After he was defeated in his bid for re-election in Cardston-Taber-Warner in 2008, Hinman was returned to the Legislature by a 278-vote narrow victory in a September 2009 by-election in Calgary-Glenmore. The seat was previously represented by deputy premier Ron Stevens and was believed to be a Progressive Conservative urban stronghold. 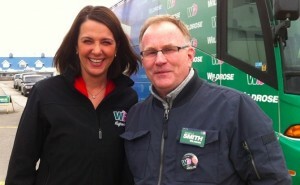 Even though he would again be unsuccessful in his bid to get re-elected in the following general election, Hinman’s win undoubtably added to the momentum of Danielle Smith‘s Wildrose Alliance going into the 2012 election. But what would have happened if Hinman had lost that by-election race in Calgary-Glenmore? 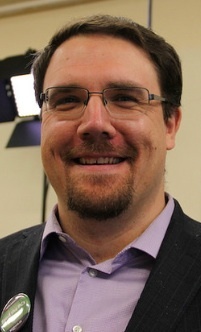 Hinman’s by-election win provided early credibility for the Wildrose Alliance by showing that the party could elect candidates in long-held PC Party constituencies. Without this by-election win, the Wildrose Alliance’s momentum could have stalled or slowed going into the 2012 election. Liberal candidate Avalon Roberts finished only 278 votes behind Hinman. Had she won the by-election, David Swann might have stayed on as party leader instead of resigning in 2011. A win in Glenmore might have led the Liberals to experience a resurgence in support going into the 2012 election, building on the party’s 2008 gains in Calgary. Or maybe the PCs would have simply won back the constituency in the following general election, as they did in 2012. 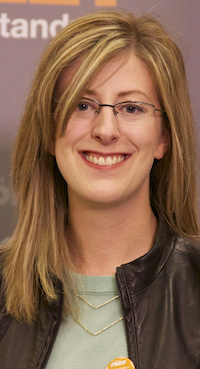 Popular city councillor Diane Colley-Urquhart placed third as the PC candidate in the by-election, which was not really a reflection of voters feelings towards her but of the unpopularity of then-premier Ed Stelmach in Calgary. If Colley-Urquhart had held on to Glenmore for the PCs, would PC MLAs Heather Forsyth and Rob Anderson have crossed the floor to the Wildrose Party in January 2010? And an even larger ‘what-if’ question is, if Hinman had not won the by-election and his party’s momentum had sputtered, would Stelmach have resisted pressure from his cabinet and party to resign in 2011? Would he still be premier today? While Hinman’s narrow win in a 2009 by-election is now an obscure footnote in Alberta’s political history, its impact on our province’s political environment and the split it helped create in the conservative movement in Alberta was huge. Thinking about these kinds of scenarios can be endless fun for politicos (or at least for me). This entry was posted in Alberta Politics and tagged 2009 Calgary-Glenmore by-election, Alberta Alliance, Avalon Roberts, Calgary-Glenmore, Danielle Smith, David Swann, Diane Colley-Urquhart, Ed Stelmach, Heather Forsyth, Paul Hinman, Rob Anderson, Ron Stevens, United Conservative Party, Wildrose Alliance Party on September 13, 2017 by Dave Cournoyer. 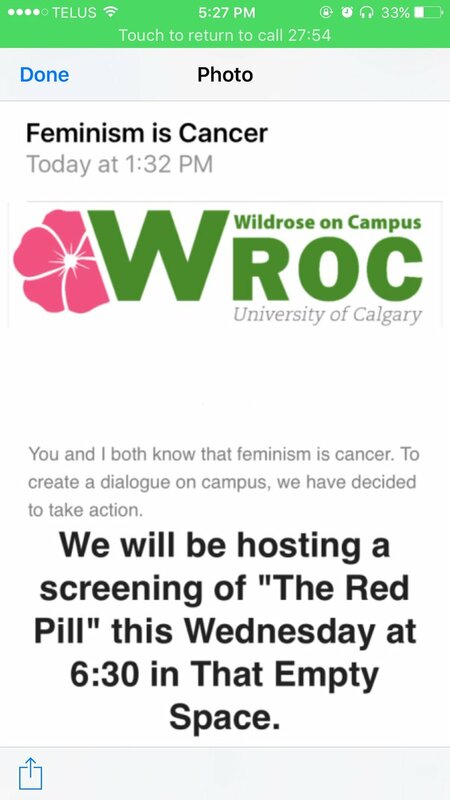 “Feminism is Cancer” was the subject line of an email sent out by the Wildrose Party campus club at the University of Calgary promoting the showing of the film “Red Pill.” The Wildrose club planned to screen the film, which online reviews describe as exploring Men’s Rights issues, on the U of C campus on International Women’s Day. The Oxford Dictionary defines feminism as “the advocacy of women’s rights on the ground of the equality of the sexes” and I will assume that the Young Wildrosers who wrote the email were not referring to cancer by its purely medical definition. The email and the event are offensive and after a swift backlash online, the club responded on twitter that it had fired its director of communications and was no longer co-sponsoring the event. The federal Conservative Party club also announced it would no long co-sponsor the film screening but the event is still being held by another co-sponsor, a group calling itself the “Canadian Advocates for Freedom and Liberty.” It is bizarre that even a campus political club would be so tone-deaf and insensitive, especially with talk of creating a new conservative party before the next election. Last month the same Wildrose campus club announced it had endorsed Jason Kenney‘s bid to dissolve the Progressive Conservative Party and lead a new conservative party. It would be easy to chalk up the “Feminism is Cancer” email to student tomfoolery or immaturity if it were not already part of a trend of Wildrose Party bozo-eruptions that go all the way back to the 2012 election. 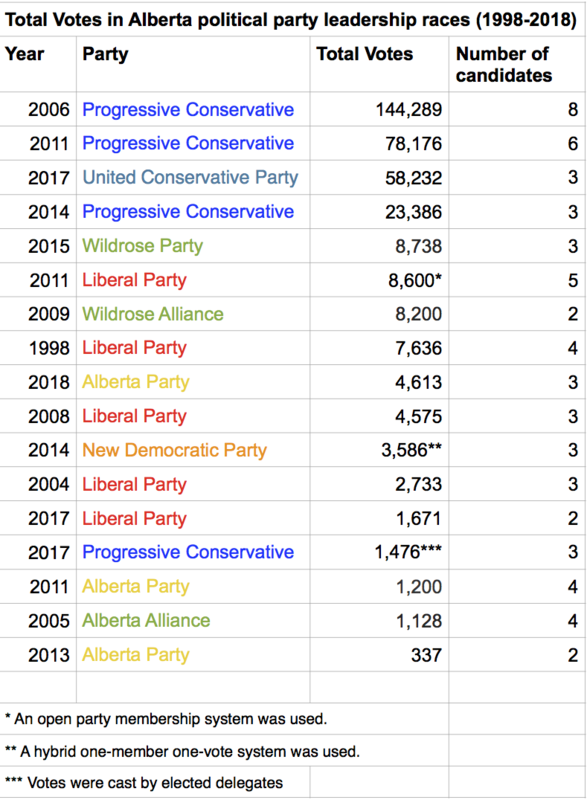 The blog post predicting an ‘eternity in the lake of fire’ for gays and lesbians and claims of a caucasian advantage by mostly unknown candidates in that election likely cost the Wildrose Party its chance of forming government in 2012. More recently, nine Wildrose MLAs were called out for signing an op-ed sent to rural newspapers that compared the NDP government’s carbon tax to the Holodomor, the genocide that killed an estimated 2.5–7.5 million Ukrainians in the Soviet Union from 1932 to 1933. And there was the incident surrounding Derek Fildebrandt’s “suspension” from the Wildrose caucus, which ended up lasting around 72 hours in total. Weird tirades against the threat of communism and denial of climate change by Wildrose MLAs just add more flames to the [lake of] fire. Back in 2012, before the Lake of Fire became part of the province’s political lingo, then-party leader Danielle Smith confirmed the existence of a good conduct bonds of $1,000 to be paid by anyone who ran for a Wildrose Party nomination. Maybe it will be time for Brian Jean and Jason Kenney to increase the good conduct bond to $10,000? 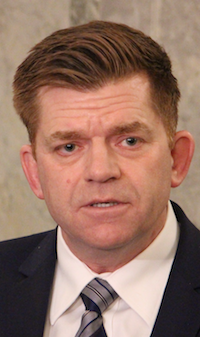 This entry was posted in Alberta Politics and tagged Bozo-Eruption, Brian Jean, Canadian Advocates for Freedom and Liberty, Carbon Tax, Danielle Smith, Derek Fildebrandt, Feminism is Cancer, Holodomor, International Women's Day, Jason Kenney, Lake of Fire, Red Pill, University of Calgary Campus Club, Wildrose Party on March 7, 2017 by Dave Cournoyer. Considering the incredible political change that has taken place in Alberta in the past few years, it is almost difficult to believe that it has only been four years since Alberta’s political parties were rolling out their campaigns on the first day of the 2012 provincial election. Like most campaigns, the issue that defined the first week of the campaign was old news by the end of the campaign. 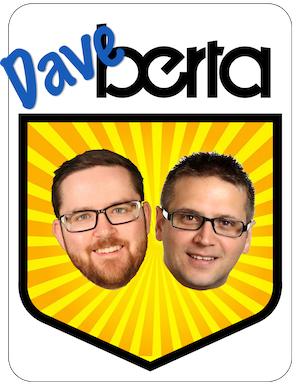 By day 28 of the campaign, most Albertans had stopped paying attention to Tory corruption and incompetence, and instead were focusing on the bozo-eruptions coming from the Wildrose Party’s social conservative base. 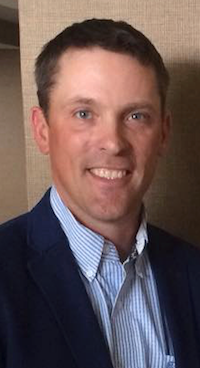 When the votes were counted, Fortress Rural Alberta, a key part of the PC Party’s governing coalition since the 1975 election, was firmly occupied by the Wildrose Party. But Alberta’s urban centres, shocked by the Wildrose Party’s social conservative streak, flocked to the PCs. Ms. Redford’s message of ‘no tax increases and no service cuts‘ resonated among liberals and moderate conservatives but it was a promise the PCs could not deliver. The PCs would form their final consecutive majority government since 1971 with 61 seats in the Legislature. 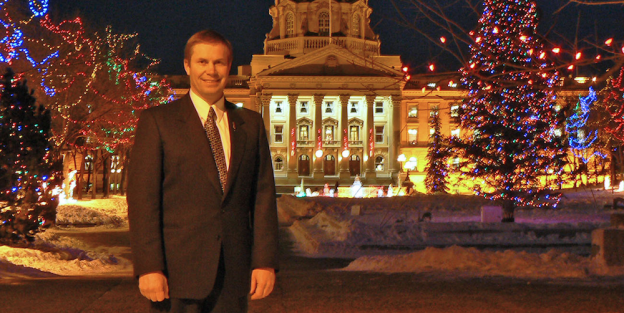 The Wildrose Party formed Official Opposition for the first time by electing 17 MLAs. The Liberals lost Official Opposition status for the first time since 1993 after only five MLAs were elected. The NDP doubled their opposition caucus with four MLAs. The Alberta Party had hoped to make a breakthrough in that election but would have to wait until 2015 to elect its first MLA. Four years later, each of Alberta’s major political parties from that election have undergone a leadership change. Where are those former leaders now? Alison Redford is now the Executive Director of the Canadian Transition Energy Initiative at the Conference Board of Canada. 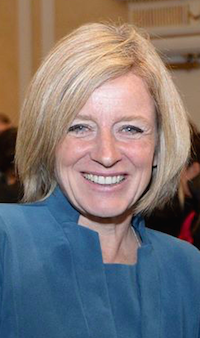 She stepped down as premier of Alberta on March 23, 2014 after her party and government were engulfed in controversy and scandal. Danielle Smith is now the host of Afternoons with Danielle Smith on NewsTalk 770 in Calgary. 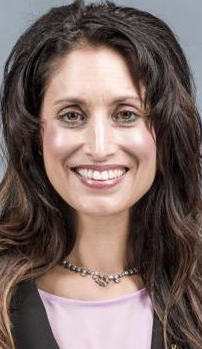 Ms. Smith’s elected career came to an end when she crossed the floor and was unable to secure a PC Party nomination in the Highwood constituency before the 2015 election. Raj Sherman is practicing family medicine at the Royal Alexandra Hospital, according to his listing on the College of Physicians and Surgeons website. Dr. Sherman stepped down as Liberal Party leader in January 2015 and did not run for re-election. He instead served as his party’s campaign manager in the 2015 election. Brian Mason is the only one of the four who is still an MLA. Mr. Mason is Alberta’s Minister of Infrastructure and Transportation and Government House Leader in the Legislative Assembly. The feisty opposition MLA led the New Democratic Party from 2004 until 2014, when he was succeeded by Rachel Notley. Ms. Notley would soon after lead her party to form its first ever majority government in May 2015. 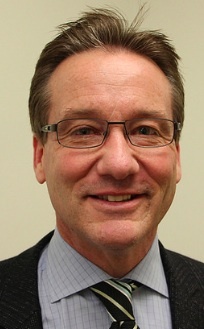 Glenn Taylor stepped down as leader of the Alberta Party in late 2012. 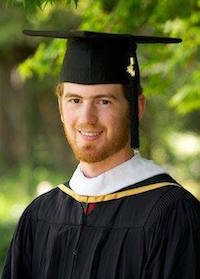 Mr. Taylor previously served as Mayor of the Town of Hinton from 2004 to 2012. This entry was posted in Alberta Politics and tagged 2012 Alberta election, Afternoons with Danielle Smith, Alison Redford, Brian Mason, Canadian Transition Energy Initiative, Conference Board of Canada, Danielle Smith, Edmonton-Glenora, Heather Klimchuk, Highwood, John Alan Ashton, No-Meet Committee, Rachel Notley, Raj Sherman on March 27, 2016 by Dave Cournoyer. 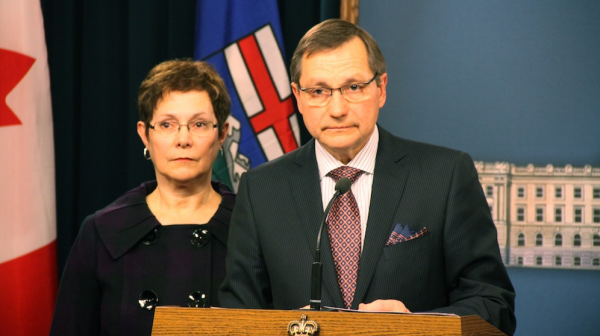 Five years ago today, Ed Stelmach began the process of quietly stepping out of the political spotlight by announcing his resignation as Premier of Alberta after nearly five years in the office. 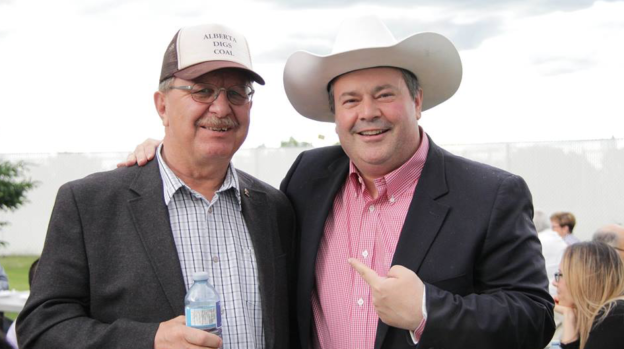 The mild-mannered farmer from the Village of Andrew dedicated more than twenty-five years of his life to municipal and provincial politics and led the Progressive Conservative Association to win one of its largest electoral victories in its forty-four years as government. Despite this win, his party’s Calgary establishment never forgave him for defeating their choice for leader in the 2006 leadership race. On January 25, 2011, facing dangerous ideological divisions in his party and caucus, Mr. Stelmach announced his decision to resign. On October 7, 2011, he was replaced as premier and party leader by Calgary MLA Alison Redford. While there were certainly controversies and missteps during his time as premier, Mr. Stelmach made a number of significant decisions that have had a positive effect on our province. Considering my history with the man, some readers may be surprised to learn that I believe history will be kind to Alberta’s thirteenth Premier. Here’s why. 1) Mr. Stelmach reinvested in public services and infrastructure. After years of neglect, his government tackled the province’s growing deferred maintenance budget by investing billions of dollars into public infrastructure. The Municipal Sustainability Initiative and the $1 billion GreenTrip Fund provided to municipalities allowed for the expansion of public transit in Alberta’s fast-growing cities. A series of 5% increases to the health care budget helped to stabilize the see-saw of unpredictable funding allocated by his predecessor, Ralph Klein. 2) The creation of the Capital Region Board helped de-escalate the tensions and narrow the deep divisions between the dozens of municipalities in the Edmonton region. While tensions still exist in some corners of the capital region, Mr. Stelmach helped usher a détente‎ by forcing the municipal politicians to use a process for resolving grievances and planning the future. 3) The creation of the Ten-Year Plan to End Homelessness set a bold plan in motion to eliminate homelessness in our province by 2017. While homelessenss will not be eliminated by 2017, the provincial plan along with plans to end homelessness in Calgary, Edmonton and other cities, thousands of Albertans have been successfully housed through programs like Housing First. 4) The introduction of the Lobbyist Registry helped shine a spotlight into the shadowy world of political lobbying and horse-trading. Although not foolproof, the registry gives Albertans a chance to see who is being paid to influence their elected officials on a daily basis. 5) During his first year in office, Mr. Stelmach concluded a deal with the Alberta Teachers’ Association in which the province agreed to contribute $2.1 billion towards the $6.6 billion unfunded pension liability. In exchange, Alberta’s 34,000 teachers agreed to a five-year contract. This is a stark contrast to his predecessor and successor, who waged war on Alberta’s public sector workers, their pensions and their unions. 6) In the spirit of former Premier Peter Lougheed, Mr. Stelmach moved the Tories back to the centre of the political spectrum. While he did not stay to face them in an election, he recognized that to compete with the right-wing Wildrose Party, then led by Danielle Smith, he needed to move his party to the middle, rather than the political right. While this angered his opponents both inside and outside his party, this decision may have helped save his party from political defeat in the 2012 election. Had he remained leader of the PC Party, he might still be Premier of Alberta today. While he never enjoyed the same level of personal popularity as Mr. Klein, I suspect the actions Mr. Stelmach took while in office will have a longer lasting positive impact in this province than those of his immediate predecessor. This entry was posted in Alberta Politics and tagged Alberta History, Alison Redford, Capital Region Board, Danielle Smith, Ed Stelmach, Homelessness, Lobbyist Registry, Municipal Sustainability Initiative, Peter Lougheed, Ralph Klein, Wildrose Party on January 25, 2016 by Dave Cournoyer.